Following a stressful start to 2018 that included a break-up, a house move and an intense period of work, my trip to Sri Lanka and the Sen Wellness Sanctuary couldn’t have come at a better time. I craved relaxation, a space to reflect and a break from the constant whir of deadlines and emails – Sen offered just that. Located in a remote corner of southern Sri Lanka just on from the town of Tangalle, the Sanctuary offers total escapism from the ‘real world’ yet a welcoming environment that feels like home the moment you walk in the door. 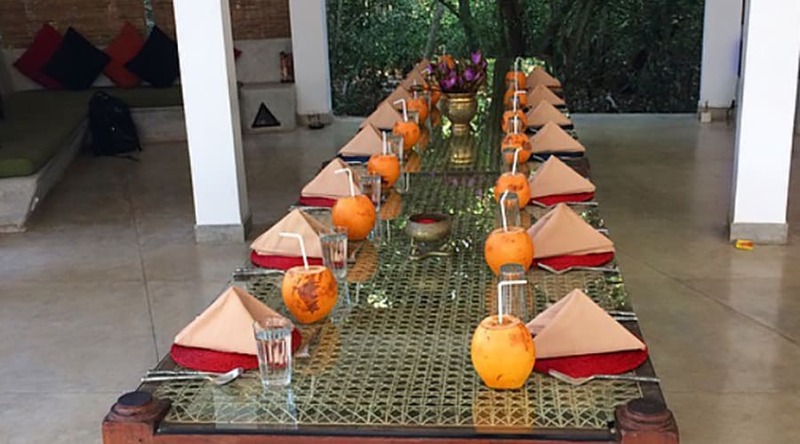 I was here for the nine day Spring Awakening Retreat which began with an opening ceremony in the yoga shala led by Sam Kankanamge, the respected osteopath and mastermind behind the centre and the retreat. Following a grounding meditation and gong bath with a Buddhist monk, we were invited to share our intention for the week. The group – all women – had a myriad of reasons for attending. While some told stories of health issues, heartbreak or feeling lost, others shared their desire to escape the business of home and attempt to find some peace. We were a whole mix of ages from our 20s to our 60s, the majority British and London based, but there were also guests from Iceland, Poland and New York. 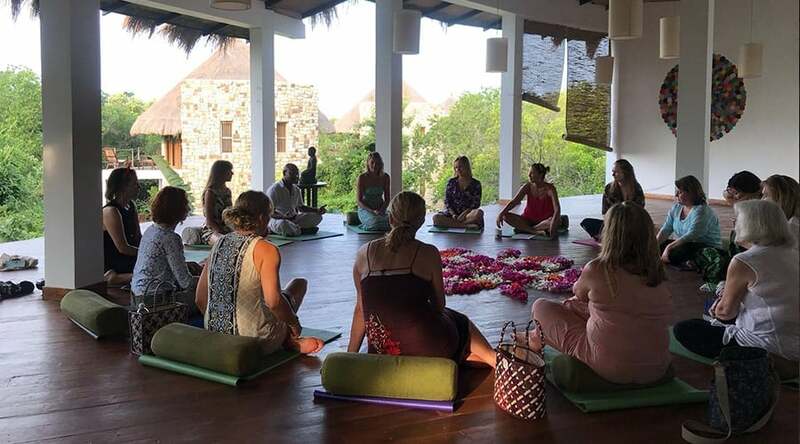 Although most of us had dabbled with wellness, we were nearly all new to the concept of ayurvedic retreats, which created a great camaraderie amongst the group. Each day followed a similar rhythm with ayurvedic treatments and delicious Sri Lankan food bookended by morning and evening yoga sessions. The day began at 5.30am with a smiling face at the door and a cup of tea (caffeine free of course) before the first yoga class. As a lover of lie-ins I imagined I would struggle with rising before dawn but I soon found myself starting to relish those quiet moments watching the sun come up from my spacious cabana, a complete contrast to my usual start squinting at my phone while scrolling through emails or social media. 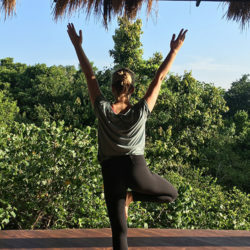 Taking place in the breezy treetop shala with views of the jungle, a chorus of tropical birds and the occasional family of monkeys, the yoga sessions led by Dutch yogi Pleuni Van Hulten were definitely worth getting out of bed for. Inspired by her dance background, the creative vinyasa classes had us feeling into our own bodies and transitioning all over the shala. It was completely different to the yoga I’d previously done and learning a new way to move proved to be a great way to escape my busy mind. The evening yin sessions were a complete contrast with a focus on breathing and stretching, and often falling asleep in savansana thanks to Pleunis hypnotic Sanskrit singing. Following an invigorating dip in the sea (which is rough, but can be braved by the strong on calmer days) and a Sri Lankan breakfast feast, there would be much excitement (and some dread) as we were delivered our bespoke box of herbal medicine from the doctor. Based on our initial consultations, health needs and dosha (ayurvedic constitution), my mixture of pills, liquid and pastes focused on detoxifying the liver and blood purification to help with my ongoing eczema and skin issues. My daily treatments tackled this too and I found myself regularly being basted in what they called a rice milk paste before being dunked in a herbal bath filled with local leaves known for their inflammation-reducing properties. While lying still for an hour covered in the uncomfortably sticky substance certainly tested my patience (and highlighted my inability to switch off), I loved relaxing in the outdoor bath watching the clouds and listening to the birds. Additionally, my stressed out mind and neck tension were treated with a series of oil-based Ayurvedic treatments, mainly massages. These ranged from gentle face and foot massages to more intense full-body pummelling sometimes using two therapists. Any British awkwardness around nakedness was put to one side thanks to the charming and caring staff who I had many laughs with despite the language barrier, and stripping off to be drenched in oil quickly became a normality. The massages were a total joy but I did struggle with some of the other treatments. I found Shirodhara – where oil is poured slowly onto your head to calm the mind – the opposite of relaxing, but it was the cleanse day that was my biggest challenge. 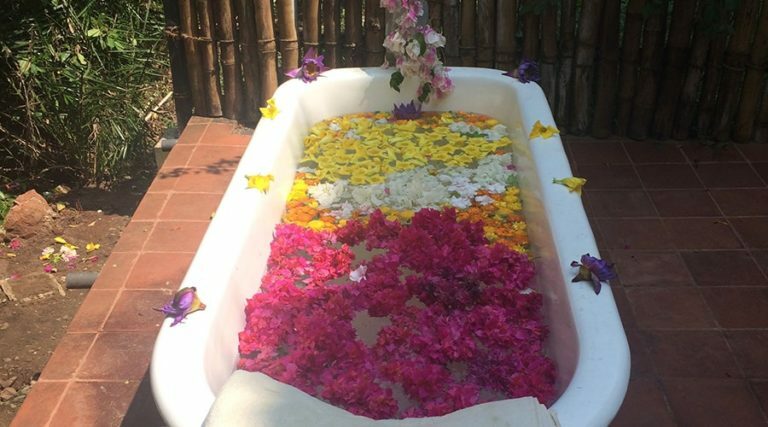 Designed to flush toxins out the body, this involved taking a herbal laxative concoction followed by two litres of hot water and missing out on a day’s worth of the delicious and inventive Sri Lankan food I had come accustomed to. As a foodie and anti ‘diets’, I was sceptical initially, but I wanted to give it a go in order to get the authentic ayurvedic experience. It was tough. My cleanse fell on the silent day which meant I spent most of the day on my own in my room (and on the toilet). Not exactly pleasant but as the ayurvedic doctor liked to remind us regularly ‘this is not a spa’. I’m not sure I felt that different afterwards but it certainly made me appreciate the rest of the week (and the eating and chatting) that bit more. What really sets Sen’s Signature Retreats apart are the one on ones and extra activities they offer. I had an enlightening chat with the local Buddhist monk about living in the present, a breakthrough meditation moment with Pleuni as she told me ‘to relax my mind like a muscle’, and osteopathy with Sam which felt more like therapy as he worked on releasing tension in my chest. I also found myself stepping outside my comfort zone to try things I would never do at home. Most notably a blindfolded trance dance. It felt extremely liberating to move without inhibition and afterwards when I removed the scarf from my eyes and walked back to my room as the sun turning a candy floss pink, I looked up and realised I felt lighter than I had in months. It was the group of women I met though that made it really special. 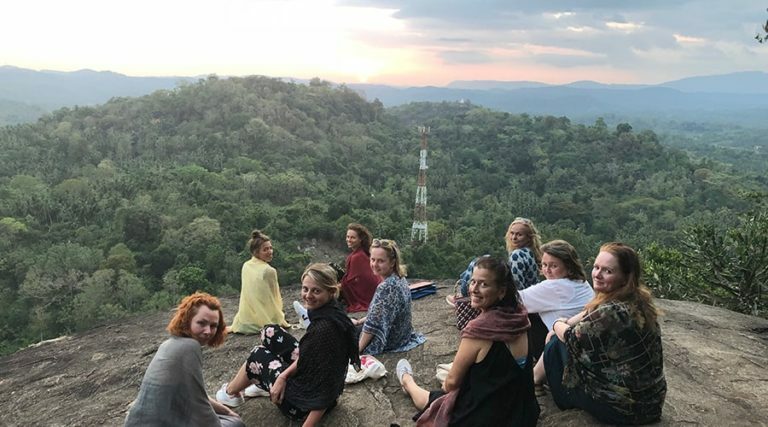 Alongside enjoying the organised excursions – including an afternoon at a surf beach where we avoided the tempting cocktails and a sunset climb to the top of a 3rd century Buddhist temple – there were also plenty of spontaneous moments of bonding and endless laughter. One night we took a post-dinner walk along the beach for turtle spotting while on another we crowded round a pair of binoculars to gaze at the incredible starry sky. While sharing our experiences of our time at Sen in the closing circle on the last evening there were tears all round. For me, the space given by the brilliant team provided a much-needed break from normality and a fresh perspective on my next steps alongside a toolbox bursting with ways to find that peace I’d experienced at Sen back home. As we each tied a ribbon to the wall and set a new intention for going home, a perfectly timed rainbow appeared in the sky – if that’s not a good omen I don’t know what is.